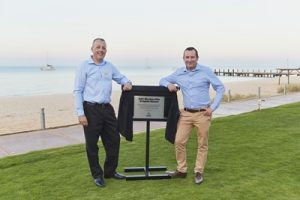 The Premier of Western Australia, the Hon Mark McGowan MLA, joined RAC to officially unveil the new and improved RAC Monkey Mia Dolphin Resort, after a redevelopment which almost doubled the capacity of the world-class venue. The Premier visited the RAC resort to mark the most significant upgrade in its 40-year history, which has seen a tripling in the number of camp sites, the introduction of new beach-front family villas, an additional swimming pool, new camp kitchens and recreation room, and a new reception building and general store which also includes the Malgana Aboriginal Cultural Centre. RAC Executive General Manager Brand and Tourism, Tony Pickworth, said the $20 million redevelopment had increased capacity at the resort from 600 guests to approximately 1,000. “We’ve undergone the most substantial upgrade to the resort since it was first opened in 1974, increasing its size from 4 to 9 hectares, adding brand new beach-front villas and almost tripling the number of powered sites to 129, with a further 80 grassed unpowered sites,” Mr Pickworth said. The completion of the redevelopment coincides with RAC also investing over $300,000 into the Shark Bay Airport, including widening and sealing of the runway. RAC’s investment is part of a $620,000 total funding package in partnership with the State Government through the Regional Airports Development Scheme (RADS). With more flight options now available via Regional Express Airlines, visitation to the region has already increased. “The combination of improved flight options into the area with this historic redevelopment means more Western Australians will have the chance to experience a world-class tourism destination,” Mr Pickworth said.